We define ourselves by what we see, the things we touch, the ground we stand upon; we define ourselves by what we know, for the most part, rather than what we don’t know. Hence the conundrum as we sailed northwards on HMNZS Otago: the group of artists had to establish their creative co-ordinates in the middle of a complex, bewildering oceanic reality, of which only the surface was visible and which extended far beyond human comprehension. We were in deep water, you could say. We were in over our heads. With the last vestiges of mainland New Zealand far behind, our eyes registered the jagged surface of a three to four metre head-sea. The vessel we were voyaging on—a humming, rolling, metallic island—only exaggerated the strangeness of the encounter, the loss of familiar bearings. While our naval hosts offered various pointers—and we could follow our progress northwards on the ship’s charts— they stressed the inadequacy of their information. Far from commercial shipping lanes, the ocean surrounding the Kermadec Ridge remains largely unsurveyed. No one knows the precise number of underwater volcanoes in the region, or where indeed they are located—hence a vigilant eye is kept from the bridge at all times. We were told that maps made at the time of Cook’s voyages remain, to this day, the most accurate accounts of parts of this region. How, then, is the Kermadec expedition reflected in the works that have been made since returning from the voyage? What circumstances of the voyage have been rephrased or reanimated in these works? Certain points in time and space continue to resonate: the generator shed on Raoul, a flying fox above Fishing Rock, the ship’s bell, a mousetrap washed up on Oneraki Beach, a flying fish, a fiery sunrise, a cloud forest... Yet alongside these vivid and resonant images, something inherently abstract at the heart of the experience lingers: the surging energy of the sea, the slowness of the voyage and the rhythm of shipboard life. While navigators follow lines on maps and scientists follow specific lines of inquiry, artists follow a line of thinking or the line made by brush or pen on a page; writers might follow the poetic line: ‘By frigate and bird / we came ashore, / by balloon boat and beggar fish...’ At the same time, as Rebecca Priestley writes elsewhere in this publication, artists and scientists both look to the natural world in the hope of opening up new territory, of discovering something. Both need to invent or acquire a language, and a tone, with which to present their observations, speculations and assertions. The most apparent difference, however, is that artists don’t need to verify facts; they don’t have to prove anything. In the art made during and after the voyage I recognise the laying down of co-ordinates that are subjective and essentially imaginative in nature. Having ‘tilted the field’, to use Harris’s phrase, the artists each had to achieve a tenuous hold on both the details of what they encountered and the broader shape of their experience. A case in point, Phil Dadson’s ‘rock records’ pay an almost archaeological attention to the particulars of nature—the discs feature rubbings from Kermadec rocks—while the arrangement of these discs on the gallery wall suggests a geological diagram or navigational chart. Robin White’s vast, three-part tapa work— which might be described as, literally, field- like—encompasses three realities: Aotearoa/ New Zealand, the Kermadecs and Tonga. It is not so much an act of mapping as an act of translating a voyage into fields of formal and symbolic patterning. Not unrelatedly, Fiona Hall’s Listing to starboard takes elements of empirical measurement (folding wooden rulers), colonialism (the Union Jack in the corner of the New Zealand flag) and commercial culture (caps from beer bottles) to map non-geographical realities. In John Pule’s The Home and The World, vertical and horizontal lines divide up the surface of the work like a nautical chart or calendar, while fish/animal/human forms establish a twisting, agitated wave-like movement across much of the pictorial plane. On earlier occasions, Pule has likened this kind of geometrical division of space/ reality to the floorplan of the Niuean village where he was born, or the South Auckland state house in which he grew up. While such an ‘architectural’ grid is maintained in his ‘Kermadec’ paintings, the emphasis in these new works has shifted to accommodate, more than ever, a sense of roiling, oceanic flux. The plethora of plant-like forms, at once terrestrial and subaquatic, is another new and notable development in his work. The Home and The World begs the question: to what extent we are at home in this world; and to what extent is our (human) home in harmony with the wider (natural) world? With their networks of linkages, intersections and crosscurrents, John Pule’s paintings also ask where it is we stand amidst the order and the chaos of our inner and outer lives. Are we saying hello or, as in Tomorrow we leave, goodbye? For the duration of the voyage, HMNZS Otago was both artists’ studio and viewing platform. While the experience of the ocean was for the most part liberating, the reality of shipboard life was visceral and challenging. Grinding northwards at 13 knots, our thoughts and deliberations were accompanied by the incessant hum of the engines and the oceanic din beyond. During daylight hours, the artists could choose between the claustrophobia of the ship’s windowless interior and the agoraphobia of the pitching deck. The interior of the Otago was a labyrinthine underworld, with a network of stairwells and sealed off corridors. In this enclosed world, language itself had been noticeably altered. Naval personnel constantly had to remind us that our vessel was a ship, not a boat (‘a boat is something that can be lifted onto a ship’). Significant adjustments were made to our lexicon: left/right became ‘port/ starboard’, a bed became a ‘pit’, clothing a ‘rig’, the dining room was a ‘mess’, a map became a ‘chart’, and a trip a ‘voyage’. We were made aware, as outsiders, of the vessel as a self-contained information system, with its coded messages and incomprehensible markings. Jason O’Hara’s photographic montage captures something of this sealed- off, self-referential universe of signs and meanings. another teeming information-system. 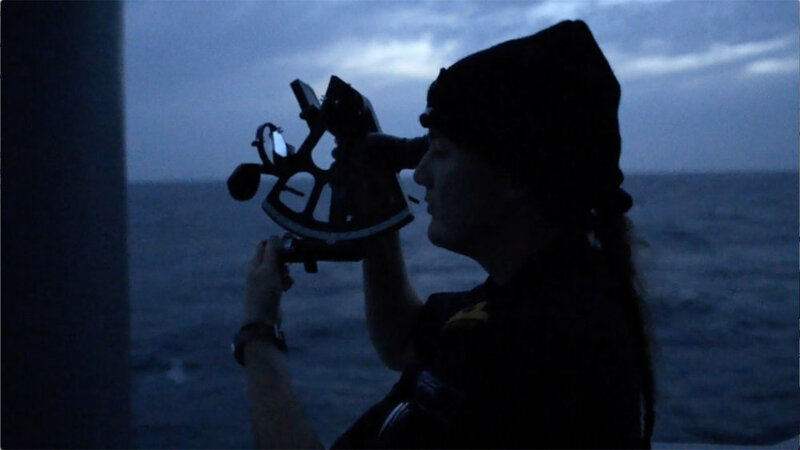 Confronted with such an extreme sense of space and distance, it came as a surprise that many of the group found that being at sea made them intensely aware of their own physicality. Both Dadson and Hall later remarked that the experience of being violently seasick had been an intrinsic and even an ‘inspiring’ part of the experience. The voyage drew mind and body into a state of oceanic alteration—a kind of in-body/ out-of-body encounter. It was as if the very molecular structure of our bodies had been shaken up and reconstituted. By way of an explanation, Dadson pointed to the simple fact that ‘60% to 70% of the body’s content is after all water, with tidal rhythms that connect us to the ocean’. part of this reality, far more apparent was the sense that, in the oceanic scheme of things, we were essentially a minor species (although our ability to foul environments has given us a status well belong that which is naturally ours). At the command ‘cease hands to bathe’, the profoundly affecting idyll came to an end. We scrambled back up the rope ladders that dangled down the side of the ship. Soon we were motoring northwards again, the Temperate Zone behind us, the Torrid Zone ahead. Upon being asked to explain aspects of naval protocol, language or tradition, more often than not, ratings and officers on the ship would tell us that such things had come to them from ‘the days of sail’. Accordingly, it was from ‘the days of sail’ that they inherited the tying of knots, the reading of charts and operation of the sextant, the dress-code, certain figures of speech (including the morning pronouncement ‘wakey wakey wakey’) and the ceremonial mid-ocean dip. Naval staff alluded to ‘the days of sail’ much the way artists cite the Grand Tradition, with a sobriety and a sense of purpose sourced in earlier times, in the consciousness of their predecessors. travelled north: I found myself daydreaming of ‘days of sail’—days made of flapping canvas, like an ensign or a spinnaker; days that gave shape to the air around us, that registered the breath, the energy and majesty of where we were. Days defined by movement, voyaging, the tilt of the sea and of our vessel upon it. With virtually no predators on the island, birds move casually across the rectangle of newly mown lawn in front of the DOC hostel. A brief comedic routine unfolds as a tui, which has been feeding on fallen fruit, manages to get its head stuck inside a grapefruit. It tosses from side to side until finally its bright yellow head-gear is flicked asunder. Not far off, at the far end of the hostel, one of the island’s few surviving predators appears to be thriving: a bird-catching plant known as a parapara (Pisonia brunoniana). Its sticky bulbs can ensnare even the largest tui, as DOC staff members have discovered on numerous occasions. Breaking with the usual conservationist protocol, in these cases they release the entrapped birds from what would be a grim, protracted fate. like the plumage of a great bird. In this re-ordered, vermin-free world, birds are once again nesting in the ground and we can hear birdsong, literally, beneath our feet. Perhaps it is our recent experiences of motion sickness that give the island colours an almost hallucinogenic intensity? The edges of things appear sharper, the reality intensified. The place appears, in equal parts, strange and beautiful. There is something outlandish, disconcerting and implausible about the abundant, exaggerated flora on Raoul Island. But it is not only the things we can see that leave a lasting impression; I am thinking of the dreamscape of mineral-rich peaks, citadels and seamounts which unfolded hundreds of metres beneath HMNZS Otago as we approached Raoul—the reefs and smoking vents and the nocturnal peregrinations of bioluminescent fishes. We had been studying photographs of these in the wardroom of the Otago. It must be the fact that the undersea environment is so under- explored and these islands so remote that makes them ripe for the imagining. According to historian Peter Conrad, ‘we originate in the sea, in the ocean of collective unconsciousness and when we reach dry land we attain the insulated state which we think of as individuality’. Upon reaching Raoul, we were each thrown into a kind of solitude—plucked, salty and sodden, from the sea urchin in whose aluminium belly we had been confined for just over two days. Our landing on the island resembled nothing if not a wreck—scudding in through three metre breakers and being shunted from the prow of an inflatable ‘rhib’ onto a rock-face, which we had to scale before the next wave came thundering in. It was a poignant moment, as each of us lurched between oceanography and geography— an experience which had the character of a birth as well as a shipwreck—a conflation hinted at by Jason O’Hara’s photograph of the rusted remains of the Kinei Maru at Denham Bay(Crucible #2), in which the ship’s hull looks like an egg that has just hatched. Peter Conrad goes on to cite Nietzsche’s belief that the shipwreck is ‘the goal, the secret intent, the true significance of the voyage’. So the group of artists was cast up, if not quite cast away. Importantly, however, Raoul Island did not feel distinct from its surrounding waters. The island is but one of a great many volcanoes, the vast majority of which don’t reach the ocean’s surface. Standing on Raoul, you never cease being mid-ocean. The island is a poignant metaphor for the Kermadec region at large, its subtropical flora echoing the luxuriant undersea life—an association which both Pule and Thomson eloquently reiterated. Staring seawards in any direction from a high point on the island, your eye follows the horizon—a line which is prominent in O’Hara’s photographs, as it is a presence in Robin White’s tapa. White notes that the creative process, like the sea voyage, is characterised by an horizon which is a constant reminder that ‘there are always things beyond; the closer you get to it the further it goes away’. Bruce Fosterexplores two more proximate lines in his photographic series Invasive Species—one suite follows the high water mark along a segment of rocky coastline on Raoul, documenting detritus that has washed up—a jandal, lengths of rope and fishing buoys, a mousetrap—while the second tracks the pink ribbons which DOC workers have wrapped around trees to demarcate places where foreign ‘invasive’ plants have been removed. With its master-narrative of environmental ruin and then restoration, Raoul Island also has its own particular history of habitation and settlement. Without a doubt, the most pervasive ghost on the island is that of Tom Bell, who transplanted his family there in 1878. ‘Tom Bell’s Dreamland’ as he thought of it, was a quintessentially 19th century utopian project, albeit a far-flung, gritty and uncompromising one. The island, uninhabited at the time he arrived, was a place where he thought reality could be moulded on his own terms—a dream he pursued for some decades before, as dreams are want to do, it crumbled. Following very much in the maverick tradition of Tom Bell, John Reynolds washed up on Oneraki Beach one morning during our island visit, wearing a bowler hat and army camouflage rig. A piece of human flotsam or a life-form dredged from a B-grade science fiction movie, he set to numbering the rocks on the beach, one to 10,000. Reynolds’s engagement with the place might be described as outlandish, implausible, disconcerting— but haven’t I already used those words to describe the environment in which we found ourselves? Labeling this piece of performance art an exercise in ‘aberrant seaside mathematics... a Sisyphean sham science project’, Reynolds’s tone is that of a hapless castaway—a Crusoe or a Gulliver. Around his neck hung a quotation from Marcus Aurelius: ‘Soon, very soon, thou wilt be ashes, or a skeleton, and either a name or not even a name; but name is sound and echo...’ Perhaps the point to be extrapolated here is that alongside everything else, ideas, words and fictions wash up on these shores, narratives of wisdom and folly left by the tide on the ambivalent rocks. A voyage is predicated on a speculation, Reynolds reminds us. And the art he has produced since his return is speculative and inconclusive by design. Picking up various threads, he has produced a number of large minimalist canvases, covered in minute markings which resemble bleeps from a navigational device far more than they do conventional brush-strokes.He returns to an unlikely equation involving vastness and a Zen-like reduction of the visible. How does something get bigger at the same time it is being reduced? How does a wave become an ocean, or a boat become a ship? Inversely—and this a question that Phil Dadson picks up—how does a ship become a boat? And how is the immensity of the world compacted into an artistic statement? Dadson’s sound art begins with the white noise of waves on Raoul Island and reduces it to the rhythmical percussion of two stones from that beach dipped in water and yeilding an intricate music. It might have been a passage from Crusoes of Sunday Island, or maybe it came to me one dream-cluttered night onboard the Otago: A massive sack of oranges is being taken off Raoul Island by way of the derrick at Fishing Rock. After hovering above a 15 foot dinghy which is tossing around on a large, glassy sea, the sack drops onto the transom of the waiting boat and splits open, releasing thousands of oranges into the water. Within moments, the waves have become bright orange, sparkling and bubbling in the sunlight. And then, just as swiftly, the bay’s considerable shark population— until now visible only as shadows beneath the water’s surface—starts attacking the fruit. In this flurry of colour and movement, it is as if an island is being born, or a world is created. That story brings me to the collision of different worlds which characterises Elizabeth Thomson’s art, with its fastidious yet heightened manner. Works such as Eden/Nightbell Gully have an extravagance which is simultaneously earthy and otherworldly—like so much of the nature we encountered on Raoul Island. While Thomson’s Caldera evokes the molten lava of the the island’s crater, the forms are actually based on human blood cells, hinting at a familiar equation in her work— that in nature one thing often implies another. A leaf suggests a grown tree, a wave suggests an ocean, an island suggests a world. Raoul Island is the site par excellence for anyone wanting to sample the kind of ‘convulsive beauty’ which lay at the heart of the Surrealists’ project and which has also been much in evidence in Thomson’s work of the past two decades. Whimsy, lyrical reverie and fancy are also qualities the Kermadecs contain or give rise to—as is the case in Jason O’Hara’s rendition of L’Esperance Rock, atop which a wobbly tower of petrol cans extends skywards, as if dreamt into being by Dr Seuss. Similarly playful is Robin White’s relocation of the ‘Willow Pattern’ scenario to 19th century Raoul Island, with HMNZS Otago moored offshore. You could say these speculations and reinventions are perfectly attuned to the heightened and unlikely realities of their geographical point of origin. Seeing is believing, we are constantly told. But there is more to believing than seeing. And more to seeing than believing. And then, between those two words, there is the making of art. The morning after our departure from Raoul Island, a flying fish landed on the aft deck of HMNZS Otago. With its shining fuselage, this bird-fish was at once a harbinger of another world and a symbol of this one. Much photographed and filmed on the morning of its incoming flight, the fish became a poignant emblem of the unexpected, irrational realm we now temporarily inhabited; it also became the unofficial mascot of our voyage. As well as appearing in a da Vinci-esque drawing by Robin White (and making numerous appearances in her large tapa), the creature surfaced in Hall’s Shoot the Breeze, setting a course right through a sardine tin, as translucent as it is transcendent. In the months since the Kermadec expedition, the nine artists involved have explored, in their work, the ramifications of the voyage. The artist who has perhaps most stridently addressed the environmental issues facing the Kermadecs is Fiona Hall. Incorporating elements of traditional Tongan tapa, while alluding to age-old traditions of scrimshaw and marine painting, Hall’s Ghost Net and associated works tackle head-on such pressing issues as the violation of the undersea environment by corporate interests, and the need for intelligent management of oceans. For an account of the pure sensation of voyaging, landfall then immersion in an alien world, Phil Dadson’s Pax offers a sequence of views through a portal, which could also be sound-images seen from inside an ear-drum, looking outwards. He presents elements of a world that is alluring and tactile, but forever out of reach. Elements from that same Pacific world attain, in Robin White’s work, an almost classical symmetry, while also being imbued with a sense of prayerful communion. a part of New Zealand that the country’s imagination had yet to even start to accommodate. Each of the artists involved in the Kermadec project had been, you could say, pushed out to sea. While the ship followed a single, discrete line on a nautical chart, the artists each drew their own lines from there— points of departure which were also, as these works attest, points of arrival. The voyage was an act of claiming this region as part of our intellectual, imaginative and spiritual domain. It also brought us into a deeper recognition of the fact that we inhabit an area of the planet known as ‘Oceania’. As denizens of dry land, our sense of where we belong tends to end at high tide mark. Accordingly, a vast nautical expanse such as the Kermadecs doesn’t enter too easily into our sense of who and where we are. Perhaps this is where art can play a valuable part. Art fires up the consciousness, it jostles one’s presuppositions just as it rattles the optic nerve; it makes us see differently. We must, as Robin White kept reminding us during the voyage, be in a perpetual state of learning—we need to look beyond accustomed parameters. We must learn to inhabit a tilted field, beit the deck of an ocean-going vessel, the surface of a churning sea or the northward slopes of Raoul Island. We must learn to think new thoughts and find new ways of being articulate. Art can offer us new languages, new meanings; the trip can become a voyage and our boat a ship, bearing us onwards into the presence of vast information systems, mysteries, wonders and a deeper awareness of our relationship to our ocean-planet.